Located at the entrance of the Blenio Valley, Malvaglia Valley welcomes you with its stunningly diverse and untainted landscapes. From the chestnut groves that mark the bottom of the valley to the perennial snow of the Adula (3,402 metres above sea level), you'll walk through mountain meadows, peatlands, larch woods, fir forests and Alpine pastures. Old traditional houses, the mill and the bread oven, mountain pastures, ancient rock engravings, the heritage of this valley goes back to ancient times, when the first communities settled here. You can explore the valley's history thanks to a rich network of paths guiding you to the different landmarks. The routes vary in length and difficulty, allowing a great experience for families, expert hikers as well as occasional walkers. You can choose to stay for the night in the fully renovated old rural houses, to get an authentic experience of the valley's households, or rest in the old pasture of Prou, reconverted to a simple accommodation. You can also sleep in the modern hostel of Dagro or in the former school of Dandrio, now an alpine refuge, or even in the comfortable Quarnei hut, which offers a great view of the valley. The cablecar, running all year from Malvaglia, will take you in just eight minutes to the sun terrace of Dagro, situated at 1,400 metres above sea level. During summertime, it is also possible to take the paved road to the valley. If you prefer to hike to your destination, you can choose one of the numerous stunning pathways crossing the upper Blenio Valley and the Riviera and Grigioni mountains. 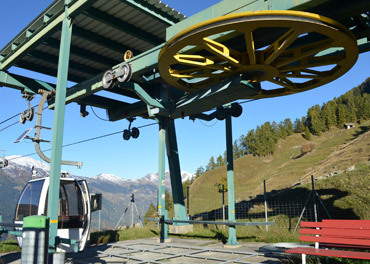 The first cable car of Malvaglia circulated between the centre of the village and Pontei, almost 400 meters higher. It was composed of a white coach, used for public transport, and a red one, that was used for animals and commodities. The project was born out of necessity and modeled on a similar one in the Canton of Uri. As its initiator Emilio Guidi said: "Today only a rustic and difficult path links the bottom of the valley to Dandrio. And the youth are starting to leave the region". Or as Willy Baggi thought, the cable car would be a way out of the Middle Ages for the people and farmers of the Valley. Those were the thirties, and the first cable car functioned until the fifties, when the first link to the driveway to Dandrio was opened. Still today, if you take the path from the stunning Laù bridge to Pontei, you'll see the remains of the mountain station and the pylons of what is known as the first cable car in Ticino, dating back to 1935. The second cable car of Malvaglia, still running today, is said to have been born after a hunter, having caught a deer, jokingly said: "If we had a cable car now, we could go down to the valley and celebrate". 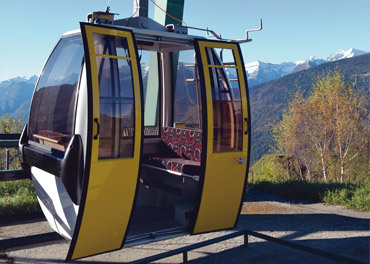 Two years later, in 1996, the second cable car of Malvaglia was inaugurated. It runs between Valserino and Dagro, covering a 1'000 metres difference in altitude. It has both a practical and a recreational purpose and is a gateway to the post-industrial era for the valley, with its typical landscape and constructions. This cable car had a tumultuous existence, being opened, closed and sold several times. 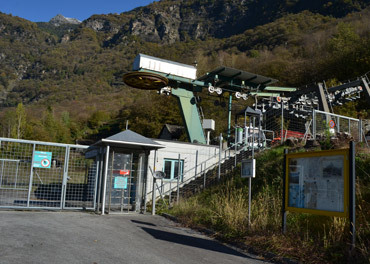 In 2014, the Filovia Malvaglia SA was taken over by a group of citizens volunteering for the cable car to function again. The same group is now also voluntarily engaged in the renewal and reopening of the Dagro Youth Hostel, which is scheduled in 2016. The historical information reported was taken from Willy Baggi and Marco Saglini's article published in the Voce di Blenio issue of September 2015. Dagro is located on a pleasant sun terrace that offers beautiful sights over a rich landscape of mountains and valleys. The picturesque family homes and barns are built at close distance, adding the harmonious colours and lights of wood and stone to the valley landscape. Only the scents and voices of the peaceful life here fill the air. This beautiful scenery speaks of times when the essential still prevailed over the futile. But this is just the start of a stunning valley landscape. To start your discovery it will take no more than to follow the many paths departing from Dagro, heritage of centuries of agricultural traditions.